FYI: Consumer analysts say that "tweens" – kids age 8 to 12 – are a 30 million strong demographic spending $38 billion dollars per year. 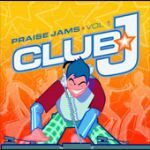 The makers of Praise Jams have truly made this project a group effort; they worked with tweens and early teenagers in target-audience focus groups to determine everything from song selection to the CD's artwork. Quote: Record executive Jeff Quimby says, "The 'tweens' and younger teens are beginning to search for music that fits their culture. Praise Jams does that while keeping a vertical focus. Stylistically, it's hot music that teens like with content that parents can feel good about." The Bottom Line: In a youth-centered entertainment world increasingly plagued by filthy lyrics and all-around declining values, a wholesome release like Praise Jams sets a much healthier spiritual tone for tweens while still sounding musically relevant. Featuring: The men and women of Club J perform 12 tracks on Praise Jams, from the techno/disco stomp opener "I Love To Be With You" to the light punk rocking "My Best Friend." Other fun cuts include an acoustic R&B take on Chris Tomlin's "Forever" and electric-charged rendition of Lincoln Brewster's "Let The Praises Ring." Three bonus "Club Trax" remixes are also featured. Special Offer:Save up to $5 on CD and CD Trax sets! Add Shout Praises! Kids 3 and Shout To The Lord Kids Volume 1 featuring up to 24 more worship songs!